Dr. Jones is the owner of Schmitt's Animal Hospital. What she loves most about her job is enjoying the human-animal bond and working with a great staff. Outside of work she enjoys kayaking, photography, and fresh water aquariums - fish and shrimp. Her four-legged family includes the larger dogs - Kara and Willow; the little guy: Forrest; and the cats: Suu Kyi, Eric, Orangey, Dori, and Tiger Lily. Her family includes the Lansing Spartans - Laura, Steve, Sarah and Chris as well as the Ann Arbor Wolverine - Josh. She graduated from Michigan State University in 1991 and has special interests in preventative medicine and dental care. Dr. Schmitt is an avid horse back rider. She spends her winter months in Arizona, riding her horses Alvin and Calvin. She also has a German Shorthair Pointer named Cheska. What she loves most about her job is the people, pets, and interesting stories and cases. She also enjoys the variability in each day's schedule. She graduated from Michigan State University in 1979 and opened Schmitt's Animal Hospital in 1984. Her special interests include reproduction, surgery, and preventative health. Dr. Timmer is very involved with dog shows. In her spare time she attends agility shows, conformation and obedience/rally events. She enjoys dog training, especially with her Boston Terriers: Victor, Eva, Dot, and Ellie, and her Boxer Calvin. She also has a cat named Oliver. What she loves most about her job is that the days are never the same, she's always learning and she enjoys the interaction between clients and their pets. She graduated from Michigan State University in 2003 and has a special interest in reproduction. Dr. Cunningham joined our staff in July 2016 after moving back to Michigan from Arizona. She has three dogs and one cat. In her spare time she enjoys spending time with her husband and daughters, Evie and Mimi. She also loves competing in agility with her dogs. She graduated from Michigan State University in 2009 and has special interests in sports medicine and surgery. 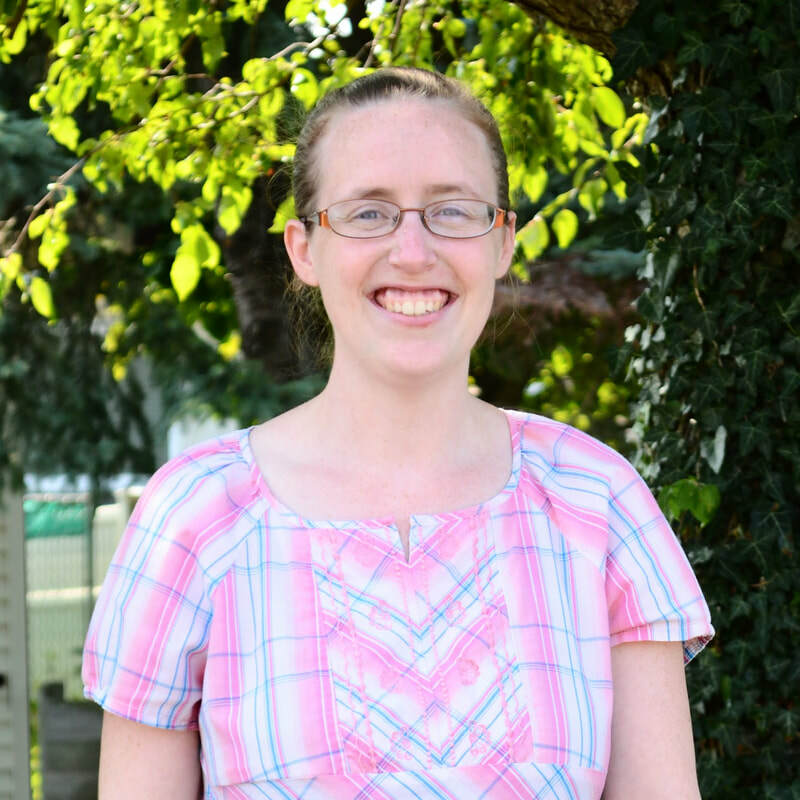 Sarah graduated from MSU in 2001 with a bachelor's degree in Veterinary Technology. She has worked at Schmitt's Animal Hospital since graduation and is the Head Technician. In 2014 she earned her Veterinary Technician Specialty in Clinical Practice (Canine/Feline). She loves this career for the variety it offers, the ever changing medical advancements, developing relationships with clients and their pets, dentistry, puppy training, and hospitalized patient care. She and her husband have one daughter, one son, three cats, and one black lab. In her spare time, Sarah and her family raise Paws with a Cause puppies. Check out her blog about assistance dogs here. Sara has been with Schmitt's Animal Hospital since her high school internship in 2006-2007. She worked as a receptionist and veterinary assistant while attending Baker College in Muskegon. She graduated in 2012 and has since been one of our Licensed Veterinary Technicians. She enjoys building bonds with clients and their pets, educating clients, and finding ways to stay organized. Sara and her husband David welcomed their daughter Sylvia in July 2016. They spend a lot of time with her parents and help watch their nieces Neecy and Deedee. They have two cats, Gracie Lou Crazy and Fox, and two Boxers: Kumi and Katter. Shelly has been working at Schmitt's Animal Hospital since November 2015. She graduated from Michigan State University with a BS in Veterinary Technology in 2007. Her favorite parts of being an LVT include dentistry and that every day is new and interesting with continuous opportunities to learn. Shelly lives with her husband, son, and daughter on a small farm with two horses, one pony, two dogs, one chinchilla, one cat, and a changing variety of other farm animals. Mackenzie graduated from Baker College of Muskegon in June 2017. She has one daughter named Lea, two cats (Carter and Nero), a chinchilla, and a leopard gecko. She loves working with dogs and cats, but also loves working with exotics and wildlife - she spent a month in Africa working with cheetah conservation groups when she was in high school. Her hobbies are reading and listening to music. Cali has been with Schmitt's Animal Hospital since May 2018. She graduated from Baker College and became a Licensed Veterinary Technician in 2014. She recently moved to Grand Rapids but grew up in Muskegon. Cali loves this field because it allows her to build relationships with so many wonderful pets and their owners. She is especially passionate about nutrition and is pursuing her VTS in veterinary nutrition. In her free time she enjoys hiking, camping, and backpacking with her fiance, Michael, and her son, Brayden. She also loves reading, gardening, and painting. She has two dogs, Darwin and Newton, a cat named Donatello, and an axolotl named Bill. Check out her Employee Spotlight here. Kathy has been a veterinary assistant at Schmitt's Animal Hospital since 2003. She was married to her husband Todd in 1986. They have four wonderful children. She enjoys walking, reading, watching movies, baking, gardening, and spending time with her family and friends. 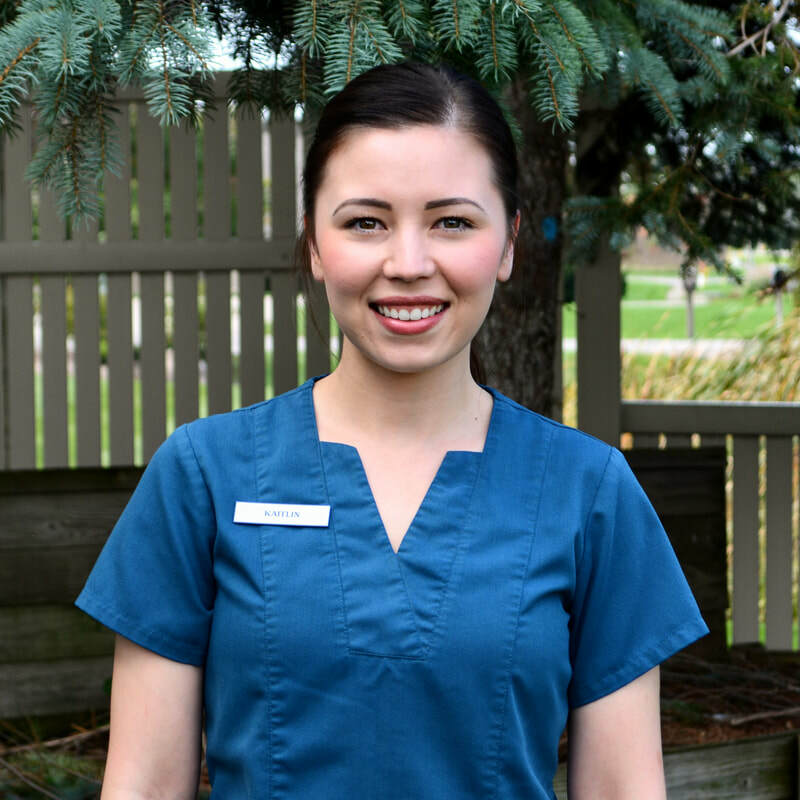 Kaitlin has been a part of the Schmitt's Animal Hospital team since July 2013. She graduated from Grand Valley State University with a BS in Biology in 2013. She and her husband have three dogs: Ira, Oakley, and Kingston; and one cat: Luna. Her favorite part of the job is being able to help people care for their furry family members. Outside of work she enjoys hiking with her family at the Saugatuck dunes, doing DIY projects around the house, and spending time with friends and family. Outside of work Alex spends her time riding and competing her horses. Alex is very active in United States Pony Club and recently competed in Nationals. She has six dogs, four cats, and seven horses that she loves dearly. What she enjoys most about her job is working with all the different pets every day. 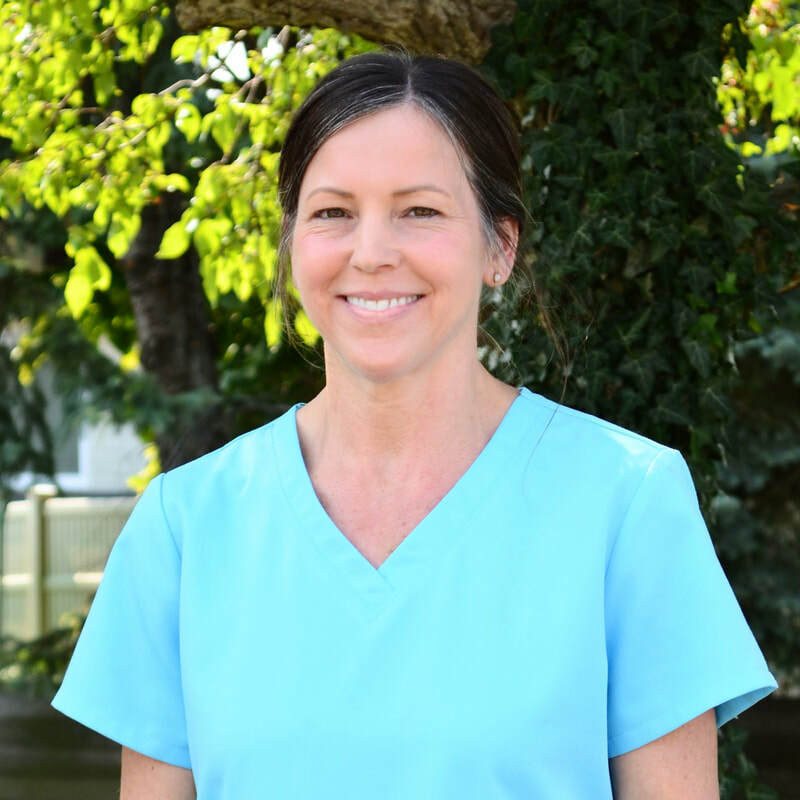 Rachael started at Schmitt's Animal Hospital in January 2018. She has two dogs - Charlie and Hobbs, and one cat - Lucy. Her favorite part about work is interacting with new animals everyday and constantly learning more about the veterinary field. Outside of work, she loves to read and spend time with her family and friends. Kelly has been at Schmitt's Animal Hospital since 2007 as a receptionist. She and her husband Mark were married in 2013 and they welcomed their twins Kynlee and Coyer in 2017. They also have two Labrador Retrievers - Rusty and Weston. 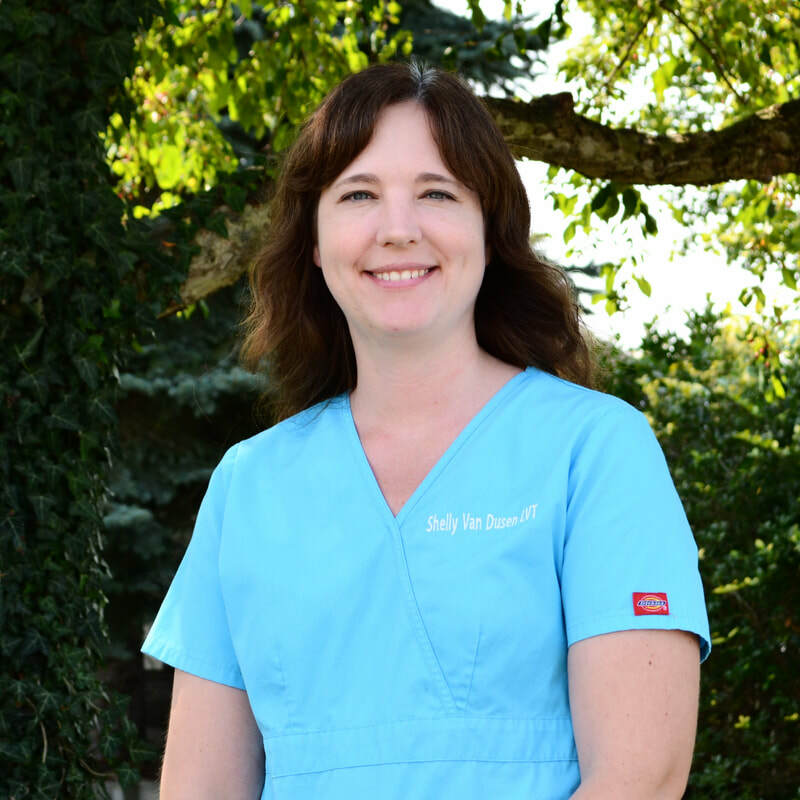 Jodi has worked at Schmitt's Animal Hospital for twenty-five years. She is blessed with a wonderful husband, two children, two step-children (+ son-in-law), two granddaughters and three dogs. She loves to spend time with her sisters playing cards. She also likes to swim, hike, travel, and shop. Sheryl has been with Schmitt's Animal Hospital since 1997. She enjoys the interaction with the pets, the interesting cases we see, and the constant opportunities to learn something new. In her spare time she enjoys spending time with her husband and two sons. Her furry family members consist of a cat and a dog - both rescues. She also enjoys the outdoors, camping, gardening, and spending time with family and friends. 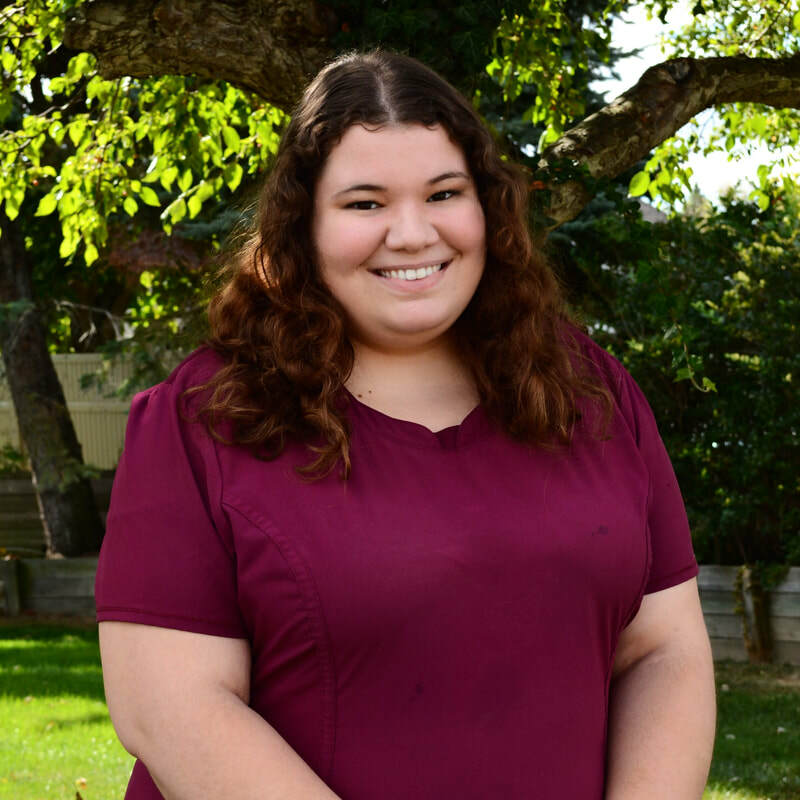 Roni started working at Schmitt's Animal Hospital in June 2017 as a part of our amazing reception team. She has one cat that she shares with her family. She loves seeing all the animals that come in to the office and ​really enjoys meeting all of our clients. Beth has been at Schmitt's Animal Hospital since July 2013. She and her husband Ben have two children - Annabel and Scott. She has four dogs, seven cats, three goats, four rabbits, and some chickens. 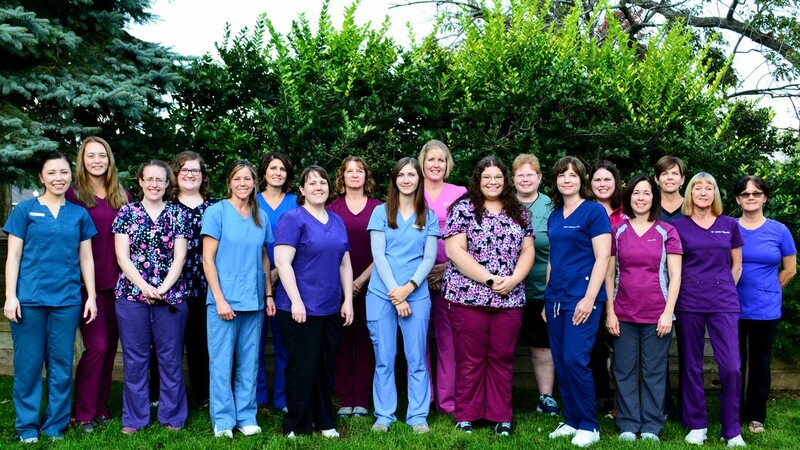 Deb has been with Schmitt's Animal Hospital since 1983 when the practice was started by Dr. Schmitt. She worked her way from receptionist to her current position as Office Manager in charge of staffing, scheduling and human resources. Deb lives in Wyoming, MI with her husband Joe, a senior cat named Charlotte and their rescue Labrador named Kenny. Deb and Joe have two children. Their son Andy, daughter-in-law Sandy and grandson Hank live in Santa Fe, NM. Their daughter Natalie and son-in-law Scott live in Grand Rapids. Jennifer has been a part of our team since 1996. She lives with her husband, two daughters, two dogs, six cats, two dart frogs, a bearded dragon, and multiple fish. The best part of her job is working with such an amazing team!